Strolling of the Heifers presents An Evening with Guy Davis — a fundraising event for Strolling of the Heifers on Friday evening, December 15 at the Robert H. Gibson River Garden (157 Main Street, Brattleboro). 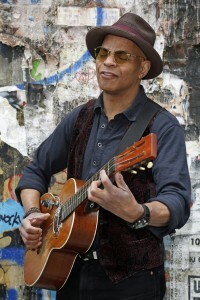 A widely-known American blues musician, Guy Davis first appeared in Brattleboro in a memorable concert alongside the legendary Pete Seeger in 2008 (also a Stroll fundraising event). His most recent album, “Sonny & Brownie’s Last Train – A Look Back at Brownie McGhee and Sonny Terry,” has just been nominated for a Grammy award in the Traditional Blues category!